miviludes-ECHR-2010The French Interministerial Mission of Vigilance and Fight against Sectarian Deviances (MIVILUDES) has adopted and implemented a policy of repression of religious minorities which is in contravention of international human rights instruments, in particular the Helsinki Accords standards on freedom of religion and non-discrimination in matters relating to religion and the European Convention on Human Rights and Fundamental Freedoms (European Convention) as interpreted by the European Court of Human Rights in Strasbourg. The European Court of Human Rights issued a unanimous, landmark decision on 10 Aine 2010 in favor of religious freedom throughout the 47 nations that have signed and ratified the European Convention, adopted by the Council of Europe in 1950. The case, Jehovah’s Witnesses of Moscow v Russia 1 has direct application to issues relating to religious minorities throughout the OSCE region. – the right of parents to ensure education and teaching in conformity with their own religious convictions. An examination of the very method and manner of operation of MIVILUDES and its basic assumptions which serve as justifications for it are in total contradiction with these findings. MIVILUDES justifies its fight against religious communities it labels as « sectarian movements » by the fact that it has received letters of complaint from some individuals unhappy about the choice of life of one of their relatives or friends adhering to a religious community, and who allege that the association with a religious group has interfered with family relations. MIVILUDES has legitimized its action against religious minorities with these complaints by unhappy family members. According to MIVILUDES, these complaints should prevail upon the right of the religious community members to conduct their life according to their own sincere religious beliefs. The entire French apparatus of fighting against « sectarian movements » is actually based on this improper approach and this mode of operation. Indeed, in furtherance of this policy, the French government supports the anti-sect association UNADFI (the National Union of Associations of Defence of Familles and Individuals) with over 90% public funding, so they can « defend families ». UNADFI, which sits at MIVILUDES’ Orientation Council, is financed by the French government to collect testimonies of individuals unhappy with the choice of life of some relatives or friends who are members of minority religious or belief groups, and to then spread one-sided and uniformly derogatory accusations in the media and to judicial authorities regarding these groups. UNADFI has been designated in Circular (Decree) of 1st December 19982 as the principal informer of the judicial authorities, in particular Prosecutors, so that prosecutions could be initiated against such groups in order to remedy « insufficiency of denouncements » of such groups. The European Court of Human Rights has analyzed very clearly this phenomenon in the Jehovah’s VVitnesses Moscow case. It found that what was alleged to constitute « coercion into destroying the family » was actually the frustration that non-Witness family members experienced as a consequence of disagreements over the manner in which their Witness relatives decided to organise their lives in accordance with the religious precepts, and their increasing isolation resulting from having been left outside the life of the community to which their Witness relatives adhered. As a matter of principle, the Court has reasserted the right to conduct one’s life in a manner of one’s own choosing and in particular the right of self-dedication to religious matters, adding that « It is a known fact that a religious way of life requires from its followers both abidance by religious rules and self-dedication to religious work that can take up a significant portion of the believer’s time and sometimes assume such extreme forms as monasticism ». The whole method and manner of operation of MIVILUDES contravenes these findings. The fact that some family members complain about problems in family relations because of the adherence of their relatives to minority religious groups is not an argument perse. But MIVILUDES, instead of pushing dialog within families, uses letters of complaint from persons unhappy about the choice of life of their relatives or friends who adhere to religious minorities to: 1) classify them as « sectarian » without further investigation; 2) stigmatize them in the media; 3) include them in a depository of records which is available to judges and prosecutors; and 4) organize raids on the targeted communities. One must understand that the break-up of the family unit and the isolation of close relatives ‘resistant’ to the discourse are part of the sectarian strategy and constitute the first step of the indoctrination. complaints against minority religious or belief movements. No access to these records has been provided for these targeted groups to respond and correct the record regarding the one-sided accusations and allegations it contains. These records are not public but have been made available to Judges, Prosecutors and social workers, as well as public officiais who have to make decisions such as authorizing or denying the renting of conference halls or nursing licences to members of minority religious or belief groups. By fuelling this biased information in a covert way, MIVILUDES is exerting undue influence on judicial authorities and public officiais in violation of the rights of the members of religious or belief groups to be presumed innocent and to not be discriminated in family matters, in their private life and occupation and in the practice of their faith. In 2008, MIVILUDES initiated a new way of « vigilance » and « fight » against minority belief groups it labels as « sectarian ». Under the pretext that it had been alerted by communications from worried individuals and families, it has engaged in unannounced strong-arm « visits » (accompanied by the media) to certain religious communities whose members feit they had to open their doors to an officiai institution such as MIVILUDES. MIVILUDES had no judicial mandate to do an investigation nor had it any power to officially impose the media on the community, but stil) it used its official capacity to impose unannounced « visits » and questioning to the varions communities, which were each time followed by derogatory media and biased reporting against the groups concerned. incomprehensible and sad. He says: « We welcomed Georges Fenech, he told us that he was not coming for an investigation but just to meet with us. And we are now bombarded with slander. He did not corne as an enemy. He came as a traitor. He used the media to crush us when there is nothing to crush. We used to be ten people or so here ».. In February 2009, alleging again that it had received letters complaining of family break-ups, MIVILUDES conducted a similar unannounced raid on another Catholic Community « Les Béatitudes » in the South of France and questioned its members. National and local media wideiy covered the raid as reported by MIVILUDES in its 2009 Annual Report. Other « visits » were performed in communities by MIVILUDES in 2009, accompanied by press and TV journalists like the one at the « Moulin des Vallées » in the West of France in Brittany in October 2009, which was ciaimed to be a « raid » by the media themselves.5 The members of the community complained afterwards to the local government representative about MIVILUDES barging into the monastery alleging a ministerial investigation to help journalists make a show — something the members never gave permission for. They complained further that, through innuendos and untruths, their choice of life was disparaged and they were made to appear as criminals in the media. The basic justification and assumption of MIVILUDES to justify this repression of religious communities is that the foilowers did not make an independent and free decision as stated by the European Court about Jehovah’s Witnesses, but rather that their adherence to such groups and beliefs has been dictated by « mental manipulation ». prosecution experts had interviewed anyone who had been coerced in that way into joining the community. On the contrary, the individual applicants and other members of the applicant community testified before the court that they had made a voluntary and conscious choice of their religion and, having accepted the faith of Jehovah’s Witnesses, followed its doctrines of their own free will. Contrary to these findings, MIVILUDES proclaims that the members of religious minorities, although they sincerely adhere to religious beliefs and associate with a religious community of their own free will, should somehow be considered as « consenting victims »who, despite their protestations to the contrary, are under « mental subjection ». Even though these individuels have made a « voluntary and conscious choice » as in the Jehovah’s Witnesses V. Russia case, MIVILUDES considers that such a choice is not worthy of respect and has no value; the individuals concerned are treated by MIVILUDES as incompetent. In the Report he submitted to the Prime Minister in 2008 entitled Justice Facing Sectarian Abuses, in which he laid out his plan of fight against « sectarian movements », the President of MIVILUDES, Mr. Fenech, explained that some doctrines or beliefs are « pseudo-religious » and « degrading’ to the individual and that their followers, who are under mental subjection, are only « apparently consenting » and are actually victims « who do not consider themselves as victfinse. For these followers, Mr. Fenech recommended that they be deprived of their civil rights and put under guardianship by a judge at the request of a third party or the family. For these consenting followers he deems incompetent, Mr. Fenech recommended also that after police raids on their communities, they be monitored during custody by a psychologist and officiais from associations of defense of families because they are « susceptible of strong emotional reactions » of protest. This follow-up is allegedly needed to ensure the « treatment » of the followers and prevent them from re-forming their community. characterize criminal offences of mental subjection in specific cases where investigations are opened on minority religious or belief groups. On the basis of the same assumption, MIVILUDES organized the raids on the communities where some family members alleged that their relatives, who were voluntarily adhering to such groups, were under « mental subjection ». — One or several people start to adhere to new ideas, differing from those usually shared by social consensus. The person who receives these ideas is lead to change all of her reference marks, relationships and projects. It is not the States’ prerogative to regulate beliefs. No State is entitled to declare that some beliefs are « pseudo-religious » or pathological. 5ahin, cited above, § 107, and Hasan and Chaush, cited above, § 78). Accordingly, the State has a narrow margin of appreciation and must advance serious and compelling reasons for an interference with the choices that people may make in pursuance of the religious standard of behaviour within the sphere of their personal autonomy. Thereby, the Court reaffirmed the right to one’s own choice in religious matters and the prohibition for States like France and its governmental agency MIVILUDES to assess the legitimacy of beliefs. MIVILUDES, in violation of the right to freedom of conscience and belief, ignores the right of individuals to choose to associate with a religion or adhere to certain religious beliefs if the religion or the beliefs have not received majority social consensus. Rather than respect the right of an individual’s personal autonomy, MIVILUDES recommends and implements measures designed to crush undesired beliefs or doctrines. These actions and policies implemented by MIVILUDES and the French government contravene the right to religious freedom guaranteed by the Helsinki Accords, the Human Rights Convention, the International Covenant on Civil and Political Rights and other international human rights instruments. An extension of the right to make one’s own choice and dedicate oneself to religious matters is the right to engage in voluntary work in support of a religious association. Jehovah’s Witnesses who carried out religious service at the Bethel community centre were not employees of the centre but unpaid volunteers. For that reason, the provisions of labour law relating to standard working hours, paid holidays and professional orientation were not applicable to them, as they did not work there for material gain. determine doctrinal standards of behaviour by which their followers must abide in their private lives. 121. It foliows that what was taken by the Russian courts to constitute an infringement by the applicant community of the right of its members to respect for their private life was in fact a manifestation of their beliefs in their private lives in the sense protected by Article 9. Vo/untary work or part-time employment or missionaty activities are not contrary to the Convention principles and the Court is unable to discern any pressing social need that could have justified the interference. In total opposition to these findings, MIVILUDES and the French authorities deny members of religious minorities the right to do any kind of voluntary work. In the 2008 Annual Report of MIVILUDES, the French Ministry of Labour confirmed its cooperation with MIVILUDES to fight against volunteering in minority religious or belief groups. In the Jehovah’s Witnesses case, the Russian authorities had justified their sanctioning of volunteering with the specious argument that it infringed the members’ right to respect for their private life, although as noted by the European Court « community members testified in the proceedings that they followed the doctrines and practices of Jehovah’s Witnesses of their own free will and personally determined for themselves their place of employment, the balance between work and free time, and the amount of time devoted to preaching or other religious activities ». 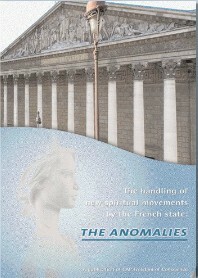 Like Russian authorities in the Jehovah’s Witnesses case, French authorities justify their fight against volunteering with the specious argument that it violates the followers’ rights through moral or financial exploitation, even though the concerned religious community members do volunteering of their own will, based on their religious convictions, which is an expression and manifestation of their beliefs according to the European Court. The French Minister of Labour stated that « The sectarian movements can already be convicted for violation of labour law, for example for moral harassment, excessive duration of work, absence of remuneration, even absence of work contract ». He added that « by making the followers do false volunteering, sects are criminally liable for illegal work, which has not been reported to social or tax a uthorities ». Pursuing this policy, MIVILUDES has been inciting harassment of religious communities by labour authorities to fight against volunteering. During its raid on the Catholic community Les Béatitudes for example, MIVILUDES urged the local government representative (Préfet) to do an investigation into the legality of the volunteering done by its followers alleging that they were financially exploited. Under the specious argument of defending the rights of the members of religious or belief minorities, MIVILUDES actually violate their right to express their beliefs and manifest them through activity in support of their religion, a right protected by Article 9 of the Convention. 125. The Court reiterates that Article 2 of Protocol No. 1 requires the State to respect the rights of parents to ensure education and teaching in conformity with their own religious convictions and that Article 5 of Protocol No. 7 establishes that spouses enjoy equality of rights in their relations with their children. By decision of 17 September 2001, the Court of Appeal of Rouen dismissed the charges of illegal work against the head of the association and the same Court sentenced on 17 July 2007 the President of UNADFI for defamation. Both parents, even in a situation where they adhere to differing doctrines or beliefs, have the same right to raise their children in accordance with their religious or non-religious convictions and any disagreements between them in relation to the necessity and extent of the children’s participation in religious practices and education are private disputes that are to be resolved according to the procedure established in domestic family law. In spite of the hypocritical assertion contained in the Report that in situations of conflict both parents have the same rights and the family judge has to rule case by case, the system which has been set in place actually denies the rights of those parents who adhere to minority belief groups. For parents who belong to religious minorities he labels as « sectarian movements », MIVILUDES’ President has set unusual procedures in domestic family law. In his 2008 Justice Facing Sectarian Drifts Report, the President of MIVILUDES recommended, as concerns family conflicts with « a sectarian background », that these cases, although civil cases, be communicated to the General Prosecutors who would check for penal offences and be assigned to specialized family judges, who would be assisted by specially trained professionals (social investigators, psychologists). He explained this derogatory regime by the need to protect children from their parents’ beliefs, approvingly quoting a psychologist who stated regarding children « victim of sects » that « it even more difficult to protect a child from his parents’ belief Chan from their beatings or their incestuous sexuality. In order to ensure such « protection », Mr. Fenech made reference to a Circular (Decree) of 29 February 1996 which gave instruction to the Prosecutors to have, pursuant to Article 375 of the Civil Code, a special educational assistance ordered for these children in order to avoid « that they be subjected to harmful influence or dangerous indoctrination, even if it is Crue that their implementation is tricky when both parents are members of the sert’. Such statements graphically evidence, whatever affirmations to the contrary, that MIVILUDES does not give equal rights to parents who are members of targeted religious minorities in case of conflicts, and that it recommends an encroachment of the parent’s rights presenting it as a « solution » to protect the child from parents’ beliefs, in violation of Articles 9 (religious freedom) and 14 (non-discrimination) of the European Convention. What Mr. Fenech derogatorily refers to as « mythical discourse » as opposed to rational explanations is precisely belief in the sense of the religious freedom principles articulated in the Helsinki Accords and the European Convention on Human Rights. He considers that some beliefs are acceptable while others are not and assesses their legitimacy, in total violation of his duty of neutrality as a State agent. In a chapter on « Youth and the Sectarian Risk » in the 2009 Report, MIVILUDES’ President, after recommending that family judges decide case by case and motivate their decisions with facts so that they do not get quashed by the European Court of Human Rights, noted with satisfaction that the law had changed following his recommendation as President of the 2006 Parliamentary Inquiry Commission on « the influence of sectarian movements and the consequences of their practices on the physical and mental health of minors ». A law of 5 March 2007 modified Article 375 of the Civil Code, making it possible for the judicial authorities to order a special educational assistance not only when a child’s health, security, morality or conditions of education are in danger like the Article used to provide, but also when the conditions of a child’s « physical, affective, intellectual and social development are seriously endangered ». These new criteria are designed to cover « situations of sectarian subjection » where the child « has blossomed, works well at school and does not complaira about anything » but has a « univocal vision of the world » referred to by Mr. Fenech. However, as regards specific knowledge of the sectarian context, the actors of the protection of children are still lacking detailed and updated information. Due to the extremely fast evolution of the movements and practices, the personnel in charge of children matters must be kept informed of the variety of situations in a regular and precise manner. Mr. Fenech recommended further information and training of these personnel as part of their continuing education on the various movements and practices which should be considered as « sectarian » by the Judges and social workers adding that « Only on the condition of this preliminary step can prevention and repression of the sectarian phenomenon be really efficient ». This kind of one-sided, biased information on religious or belief minorities, which has already been given by MIVILUDES in the form of « awareness » seminars proposed to Judges as part of their continuing education, has shown to be entirely based on documentation provided by anti-sect associations without any possibility for the concerned communities to contradict the accusations it contai ned. Witnesses and other targeted groups, with information provided by UNADFI and CCMM, and without any possibility of contradiction, debate or rebuttal by the concerned groups. As part of the documents distributed to the attending judges, press articles hostile to these groups were provided, as evidenced by the list of documents attached to the programs of the seminars. The mountain of positive jurisprudence and official recognitions regarding these groups has been completely ignored. Only a few negative court decisions were provided, and decisions from higher judicial authorities directly contradicting those decisions were also not discussed. Objective and scientific information regarding these groups was not included — neither objective scholars nor experts in the field of religion were included in the program, exposing the program as an attempt to prejudice the judiciary against minority religious organizations. Such « awareness » programs for court officiais have been condemned by the United Nations Human Rights Committee. In its Conclut/hg Observations of the Human Rights Committee: Germany. 18/11/96 (CCPR/C/79/Add.73), the Human Rights Committee recommended, in strikingly similar circumstances, that Germany discontinue the holding of « sensitizing sessions for judges against the practices of certain designated sects ». Otherwise, the right to a fair trial is destroyed for religious minorities. These recommendations of MIVILUDES regarding the treatment of family cases will inevitably result in an infringement of the rights of believers to educate their children in their own faith and in discrimination. 108. However, she is of the opinion that the policy and measures that have been adopted by the French authorities have provoked situations where the right to freedom of religion or belief of members of these groups has been unduly limited. Moreover, the public condemnation of some of these groups, as well as the stigmatization of their members, has led to certain forms of discrimination, in particular vis-à-vis their children. 111. The Special Rapporteur hopes that future actions of MIVILUDES will be in lire with the right to freedom of religion or belief and avoid past mistakes. She will continue to closely monitor the various efforts that are carried out by MIVILUDES. 112. The Special Rapporteur urges the Government to ensure that its mechanisms for dealing with these religious groups or communities of belief deliver a message based on tolerance, freedom of religion or belief and on the principle that no one can be judged for his actions other than through the appropriate judicial channels. Instead of complying with these recommendations from the United Nations, MIVILUDES continues to implement, through the adoption of administrative or legislative measures, a policy of repression which violates the rights of believers protected by the European Convention, the Helsinki Accords and the International Covenant on Civil and Political Rights. The right to religious freedom is in serious peril in France for religious minorities as the government, through MIVILUDES, continues to foster an atmosphere of intolerance and discrimination against these targeted religious communities and their members. International and legal standards mandate that religious minorities be treated fairly and without discrimination in the same way as other religions. These standards also mandate strict impartiality by government officiais and entities and in the judicial process. The case, Jehovah’s VVitnesses of Moscow y. Russia provides a clear map as to how these standards must be respected by the State. Yet, France, through the policies and actions of MIVILUDES, has contravened these standards and instead has instilled a climate of prejudice and has implemented oppressive measures designed to severely infringe upon the rights of members of targeted religions. Such oppressive measures have no place in a democratic society.